Michael was Skyping with me from Rio de Janeiro and telling me about a famous local cocktail that he’d sampled while there, the caipirinha, a muddled drink made with cachaça, limes, sugar, and ice. Of course we had to try making it at home, and after an evening sipping several different versions we created, we’ve decided the caipirinha is now on our cocktails list for parties. Cachaça is a sugar cane brandy available as both aged (gold) and unaged (white). The aged cachaça is sipped straight while the white cachaça is used in cocktails. This stuff is pretty potent, so if like me you have a low alcohol tolerance, plan on having just one. 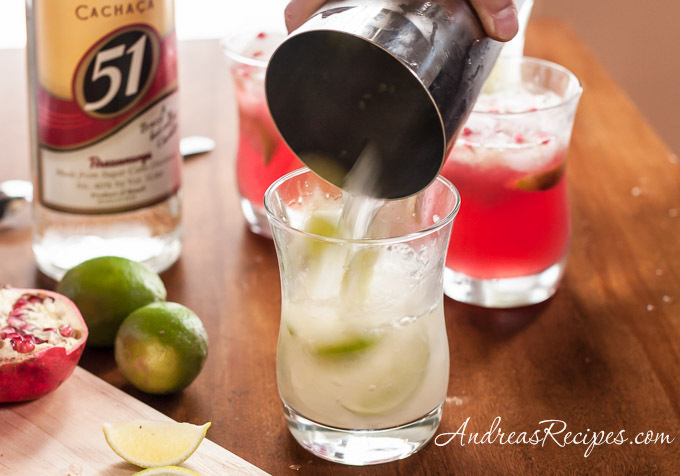 We experimented with mixing methods and decided that shaking made it pretty close to the consistency of the caipirinha Michael tasted in Rio. 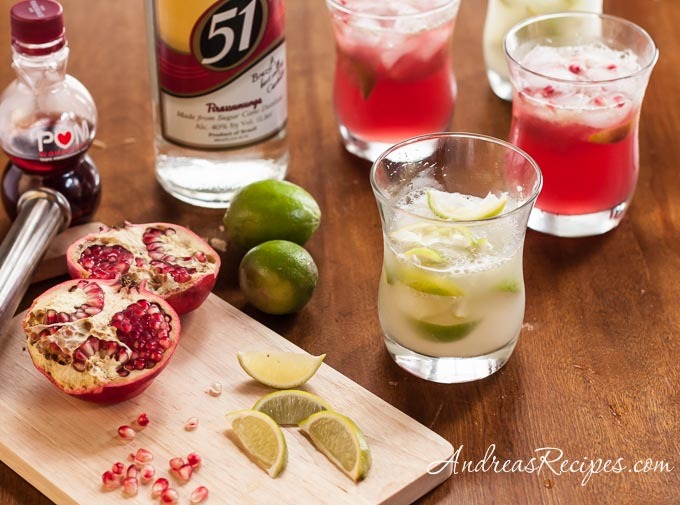 As soon as we perfected our basic recipe, we started playing with other flavors because there are many fruity variations on the caipirinha. We tried it with blueberries, pomegranate juice, and other citrus. 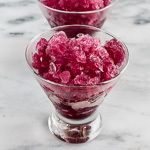 Our favorite combination turned out to be the caipirinha with pomegranate juice and a little less lime (amounts listed below). For a nonalcoholic version, just use water or seltzer water. So happy Labor Day Weekend! Pour yourself a cocktail and celebrate the last weekend of summer. Place the lime slices in the glass and sprinkle the sugar on the lime. Muddle the limes until they are pretty well smashed. Pack ice in the glass almost to the rim, then pour in the cachaça. Invert into a cocktail shaker and shake vigorously for about 10 seconds. Pour it all back into the glass and serve. How FUN! 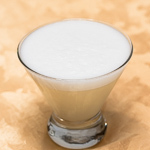 I love experimenting with cocktails but rarely do it since my husband doesn’t imbibe unless I twist his arm. The pomegranate version sounds yummy! Great photos, Andrea 🙂 New lens? My German friend introduced me to these but i use raw sugar, I drink these all Christmas day with my nana cause that’s our cocktail day. I googled the heck out of it after I had one the first time and found out that if you use more fruit and vodka its called a caprioska, our local bar makes them. Kiwi fruit or strawberry are my fav. 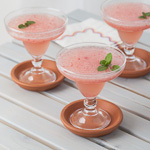 we do 1 kiwi fruit (skinned chopped) or about 4 med strawberry’s, half a lime 2 shots of vodka and a shot of sugar syrup, smoosh it up add ice and shake. we found that shaved ice/blended ice was better we even take these camping its alot of work but worth it all the same. Awesome post and I love the pictures, summer is coming soon down here cant wait for these again. Thanks Laura. I read about the kiwi version and want to give that one a try, too, it sounds great! your very welcome but beware they are addictive, and a bit better if you just blend it up lol soo much easier just remember to take the skins off the limes if you blend it. This might be a silly question but Id really like to know if this may be an easier way to do it. Has anyone used a lime squeezer and add the sugar before squeezing it on the glass then putting the mashed rind to the glass? I mean its not pretty but muddled lime doesnt look any prettier anyway. Hi Barneys. 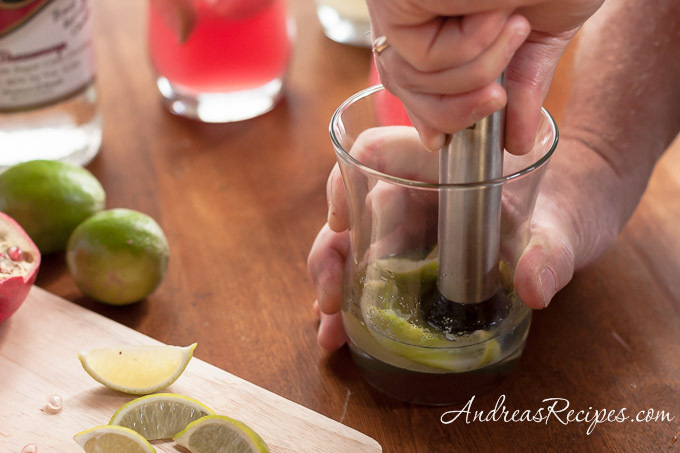 There’s nothing wrong with doing it the way you suggest, though I think muddling the lime and sugar together helps release the oils in the lime skins, which adds even more flavor.